The inn is nestled along Indian River upon an exceptional site that was selected for its captivating views and natural integrity. The serenity and ambience emulates from this natural, historic waterway that for centuries offered wildlife and peoples alike, strategic access to Newfoundland & Labrador's lucrative interior. 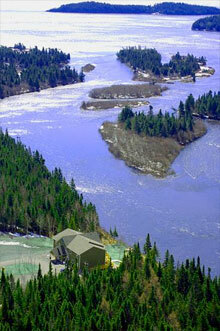 The RiverWood Inn is located approximately 10 kilometres off the TransCanada Highway on Route 390 - Springdale. 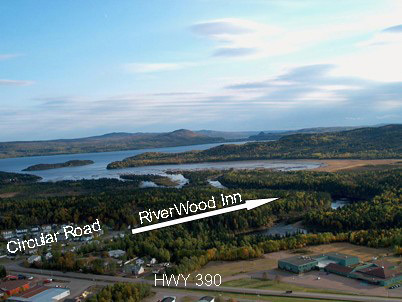 Upon entrance to this beautiful Newfoundland & Labrador town you'll note a RiverWood sign guiding you at the corner of Circular Road, turn right and proceed for about 200 meters to the entrance of RiverWood Drive (Please refer to Map 3). Then take in the spectacular views of Indian River for about 1/2 kilometer as you drive straight to a truly unique riverside retreat.